Proteolytic enzymes play central role in the biochemical mechanism of germination and intricately involved in many aspects of plant physiology and development. To study the mechanism of protein mobilization, undertaken the task of purifying and characterizing proteases, which occur transiently in germinating seeds of horse gram. Cysteine protease (CPRHG) was purified to homogeneity with 118 fold by four step procedure comprising Crude extract, (NH4)2SO4 fractionation, DEAE-Cellulose and CM-sephacel chromatography from the 2 day germinating cotyledons of horse gram (Macrotyloma uniflorum (Lam.) Verdc.). CPRHG is a monomer with molecular mass of 30 k Da, was determined by SDS-PAGE and gel filtration. The purified enzyme on IEF showed two isoforms having pI values of 5.85 and 6.1. CPRHG composed of high content of aspartic acid, glutamic acid and serine. The enzyme activity was completely inhibited by pCMB, iodoacetate and DEPC indicating cysteine and histidine residues at the active site. However, on addition of sulfhydryl reagents (cysteine, dithiothreitol, glutathione and beta-ME) reverse the strong inhibition by pCMB. The enzyme is fairly stable toward pH and temperature. 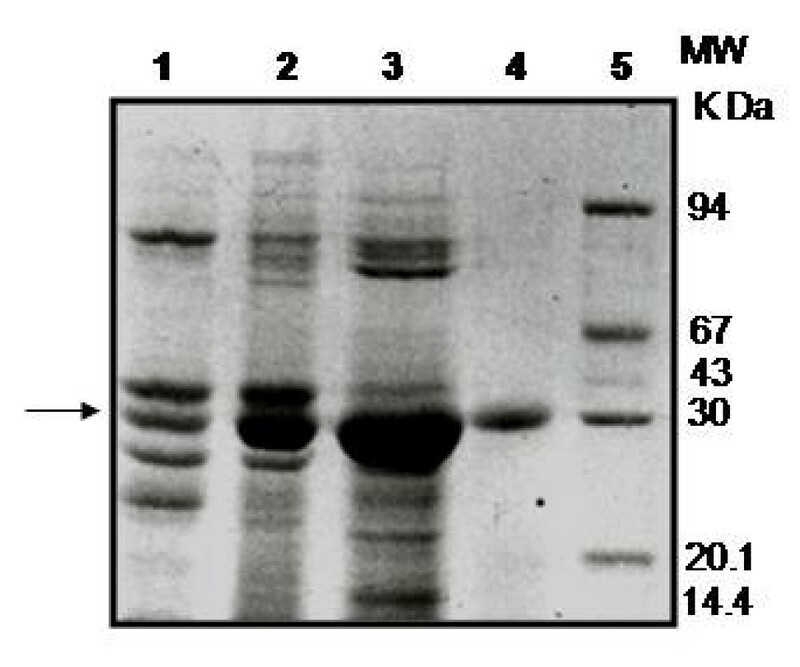 Immunoblot analysis shows that the enzyme synthesized as zymogen (preproenzyme with 81 kDa) and processed to a 40 kDa proenzyme which was further degraded to give 30 kDa active enzyme. It appears that the newly synthesized protease is inactive, and activation takes place during germination. CPRHG has a broad substrate specificity and stability in pH, temperature, etc. therefore, this protease may turn out to be an efficient choice for the pharmaceutical, medicinal, food, and biotechnology industry. Proteolytic enzymes are multifunctional enzymes that have many physiological functions in plants and animals including germination, senescence, apoptosis, complement activation, inflammation process etc. and also having commercial importance in food, leather and textile industry. Commercially they are extremely important as more than 60% of the total enzyme market is made up of proteases; they are isolated from plants, animals, bacteria and fungi. Proteolytic enzymes from the plant sources have received special attention because of their broad substrate specificity as well active in wide range of pH, temperature, and in presence of organic compounds as well as other additives [1, 2]. Search for valuable proteases with distinct specificity is always a continuous challenge for varied industrial applications. The mobilization of seed storage proteins represents one of the most important post-germination events in the growth and development of seedling. Proteolytic enzymes play central role in the biochemical mechanism of germination and intricately involved in many aspects of plant physiology and development [2, 3]. Numerous reports including our previous data supported the proteases are responsible for protein degradation. The legume seeds contain albumin and globulin storage proteins; act as amino acid reserves which are mobilized to nourish the seedling. Globulins belong to the vicillin and legumin family these are degraded by endoproteases particularly cysteine proteinase. In horse gram, during germination we observed the disappearance of high molecular weight (HMW) polypeptides of globulins and appearance of a new 25 kDa polypeptide [4–9]. To study the mechanism of protein mobilization process, many have undertaken the task of purifying and characterizing a variety of proteases, some of which occur only transiently in germinating seeds [2, 10, 11]. With renewed interest, there has been proliferation of reports in the last decade concerning purification and characterization of these proteases from germinating leguminous and non-leguminous seeds [12–16]. Exploration for existence of valuable proteases as well as understanding the appropriate physiological role of such proteases in plants is still an open area of investigation. Horse gram (Macrotyloma uniflorum (Lam.) Verdc.) is one of the lesser known, unexploited legume of the tropics and subtropics grown under dry-land agriculture. In our previous studies the pattern of mobilization of seed storage proteins and activation of proteolytic enzymes (endoprotease, carboxypeptidase and leucine aminopeptidase) were investigated in germinating horse gram seeds [7, 17]. In the present investigation we report the purification and biochemical characteristics of an endoprotease from the germinating seedlings of horse gram. It is shown that this protease is a cysteine protease (CPRHG) hitherto not known in the genus Macrotyloma with novel cleavage specificities. The cotyledons of day 2 germinating horse gram seeds were used for isolation of endoprotease, since the activity was maximal at this point during the four-day period of germination . Maximum yield of protease activity observed with 0.05 M Tris-HCl buffer pH 7.2, containing 2 mM of β-ME among other buffers (acetate, borate, phosphate buffers) used. Change in pH, alterations in molarity or omission of β-ME in the extraction buffer substantially lowered the yield of the activity (data not shown). 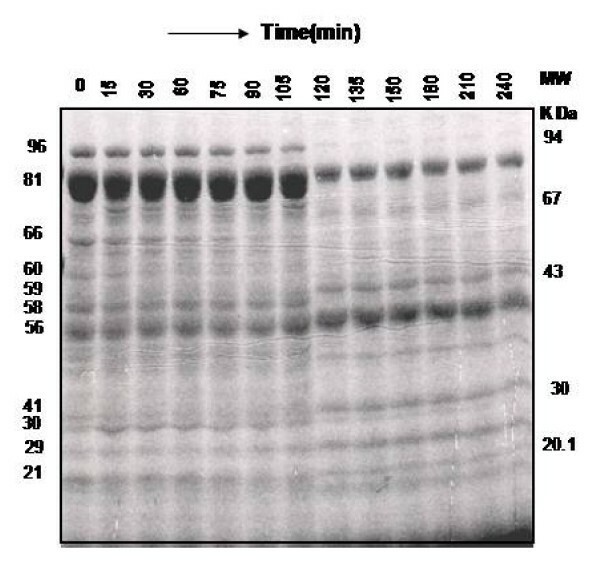 The protease activity was measured by using the chromogenic substrate, azocasein. The results of the four step purification of CPRHG were summarized in Table 1. The CPRHG was initially precipitated with (30% - 60%) ammonium sulphate and dialyzed and subjected to DEAE cellulose column. The bound enzyme was eluted with a linear gradient of KCl (0 - 0.5 M). The fractions [14–20] contained 40% of enzyme activity with specific activity of 4.80 were pooled and concentrated by ammonium sulphate (Fig. 1). The final efficient step of purification is the fractionation on CM-Sephacel. Under provided conditions, 12% of the loaded enzyme was not adsorbed to the column and eluted, that was found to be homogeneous on 10% SDS-PAGE (Fig. 2). Fractionation of enzyme on DEAE-Cellulose column: The enzyme fraction obtained from ammonium sulfate precipitation (30-60%) was loaded on to DEAE-Cellulose column equilibrated with equilibrating buffer (0.01 M Tris- HCl buffer, pH 7.0, containing 2 mM β-ME) at a flow rate of 40 ml/hr and 5 ml fractions were collected and assayed for enzyme activity as described in materials and methods. The indicated fractions (14-20) were pooled for further processing. SDS-PAGE analysis of the fractions from each step of endoprotease (EP-HG) purification from the cotyledons of germinating horse gram seeds and seedlings. Conc. of protein loaded on each well in gel is 100 ug. Lane 1. Crude extract, Lane 2. Protein from 30-60% saturated ammonium sulfate fraction. Lane 3. Pooled fractions (14-20) after DEAE-Cellulose chromatography. Lane 4. Unbound fraction from CM-Sephacel column. Lane 5. Molecular weight markers consisting of Phosphorylase b (94 k Da), BSA (67 k Da), ovalbumin (43 k Da), carbonic anhydrase (30 k Da), soybean trypsin inhibitor (20.1 k Da) and α-lactalbumin (14.4 k Da). 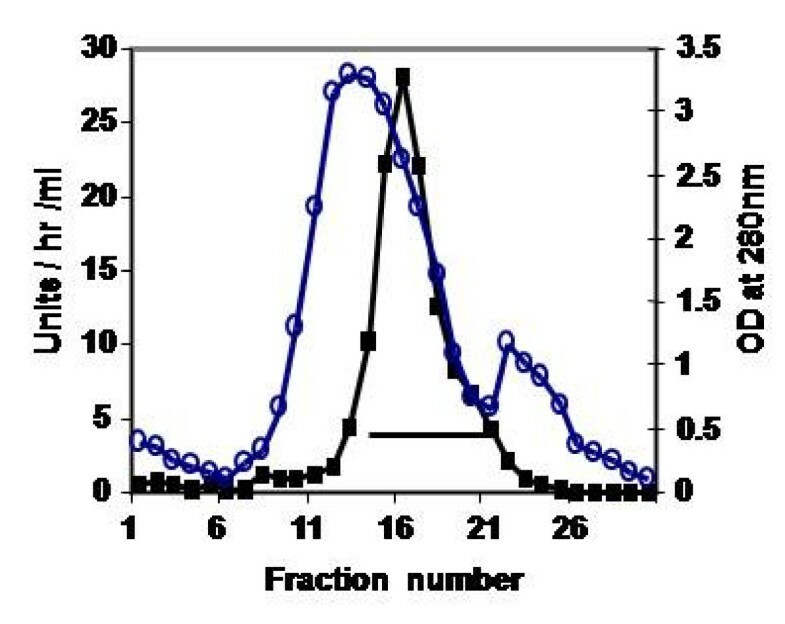 The purified CPRHG was found to be homogeneous by the detection of a single polypeptide by SDS-PAGE which is further supported by single precipitin band on immunodiffusion of the crude extract (result not shown). 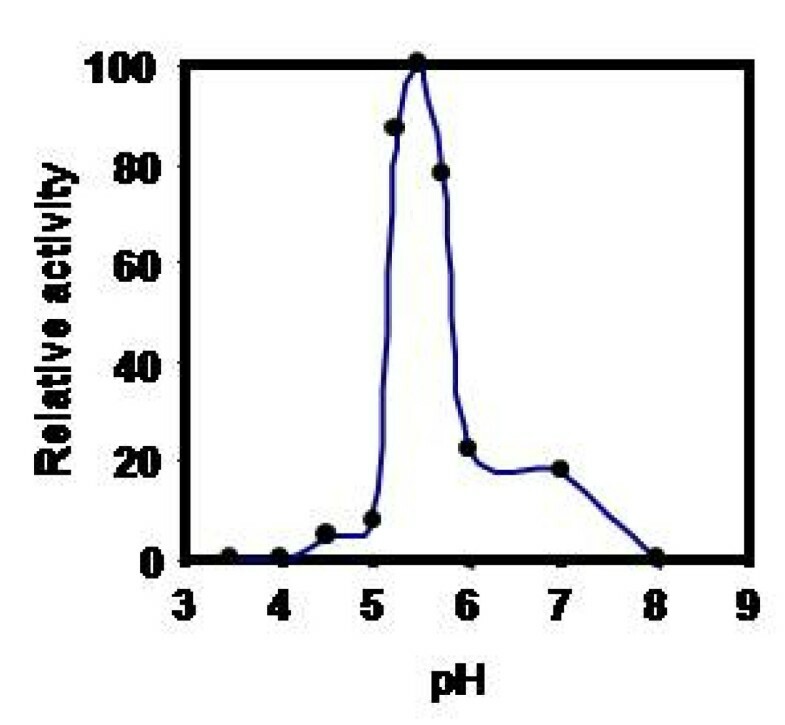 Immunoblot analysis of the purified CPRHG also conform the monoreactivity of the antiserum (Fig 3 lane 5). The size of the purified CPRHG was estimated to be 30.2 K Da on Sephadex G-100 column and the same was also supported by SDS-PAGE (Fig. 2). 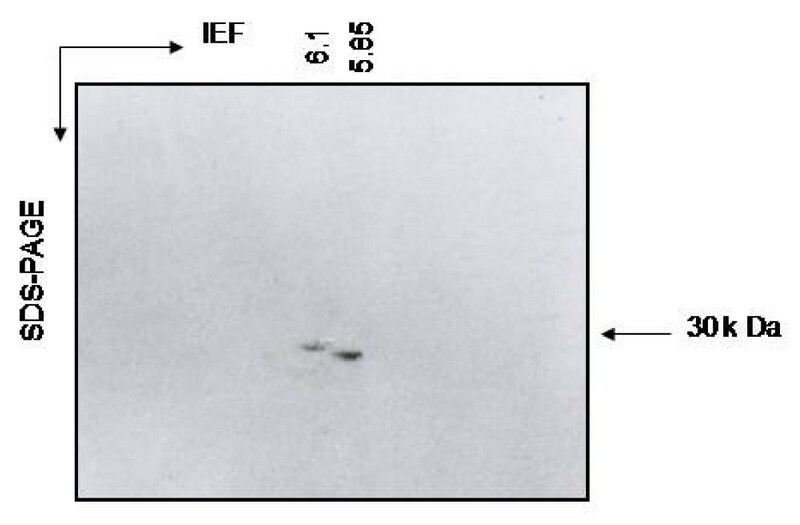 However, on isoelectrofocussing (IEF) two isoforms were observed with different pI values of 5.85 and 6.1 (Fig 4). 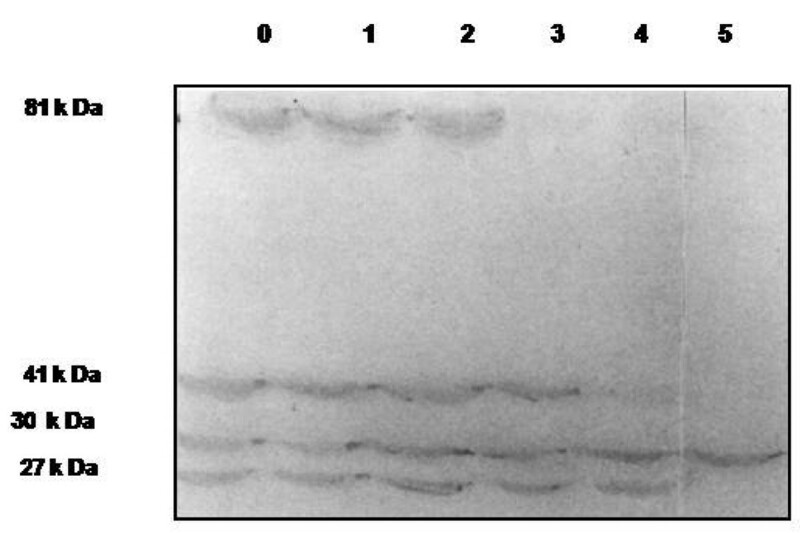 Western blot analysis of crude extracts and purified CPRHG against anti- CPRHG polyclonal antibodies: 8% SDS-PAGE, 100 μg loaded on the each lane of the gel. Lanes 0-4: Cotyledon extracts at days 0,1,2,3 and 4, respectively, from germinating horse gram seedlings. Lane 5: Purified CPRHG. Two dimensional (2D) gel electrophoresis of CPRHG: The first dimension isoelectric focusing was performed in a tube gel using wide range of ampholytes (pH 3-10). Second dimension was on 10% SDS-PAGE and was stained with coomassie brilliant blue. The amino acid analysis of CPRHG was shown relatively fewer numbers of Histidines, sulfur containing amino acids (Cys and Met) and higher number of aspartic acid (Asp), glutamic acid (Glu) and serine (Table 2). 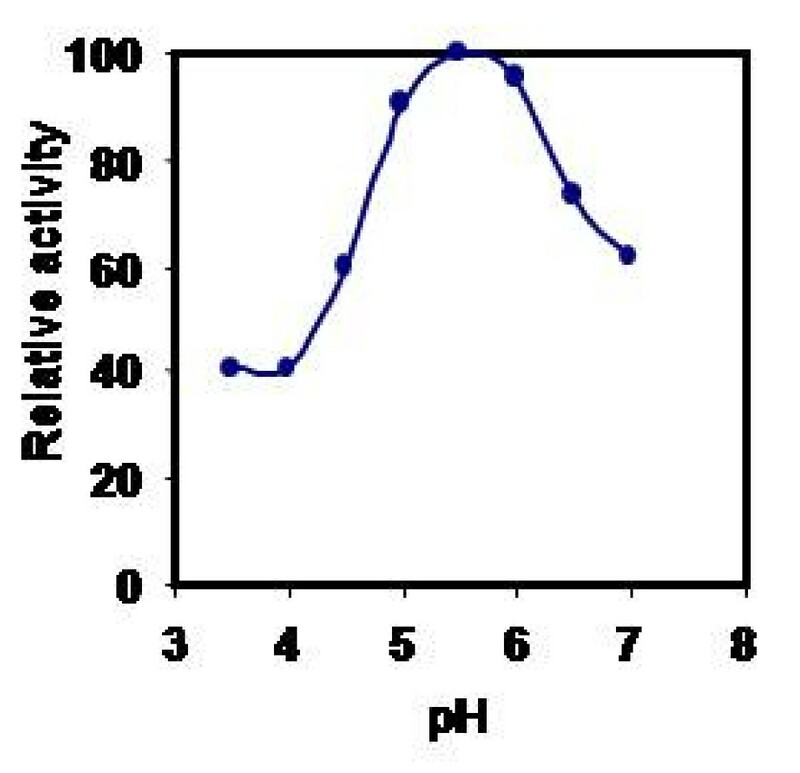 Effect of pH on CPRHG was carried out using azocasein as substrate and found the enzyme was active at acidic pH optimum, 5.5 with azocasein (Fig 5), 4.0 with hemoglobin and 5.2 with gelatin and BSA (data not shown). The activity was stable in the pH range 5.0- 6.0 (Fig 6) and also observed gradual loss of activity outside this pH range. However, the temperature vs activity profile showed an increased activity with temperature and exhibited maximal activity at 40°C (Fig 7). 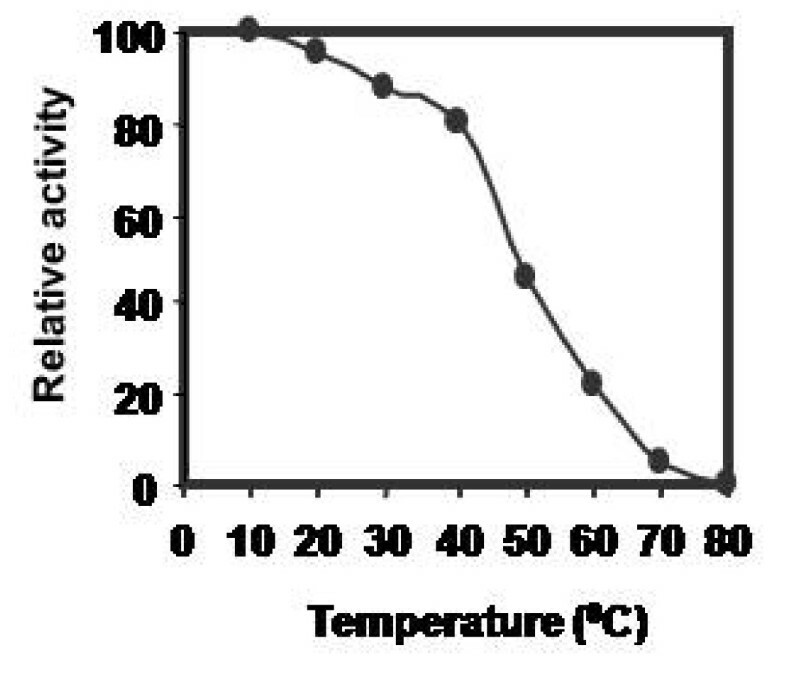 The enzyme was fairly stable at 40°C (Fig 8) and also exhibits linear proteolytic activity up to 4 h at this temperature (Fig 9). Effect of pH on the activity of CPRHG. Azocasein is the substrate for enzyme assay. P H stability of CPRHG. Azocasein is the substrate for enzyme assay. Temperature- activity profile of CPRHG. Azocasein is the substrate for enzyme assay. Thermal stability of CPRHG. Azocasein is the substrate for enzyme assay. The activity was expressed as per cent of activity at 10°C. Effect of time on reactivity of CPRHG. Azocasein is the substrate for enzyme assay. Table 3 showed the comparative hydrolytic activity of the purified CPRHG with endogenous (seed proteins) and exogenous proteins (BSA, casein, gelatin and hemoglobin). Seed protein degradation was remarkably higher than the gelatin, casein, BSA and hemoglobin. The enzyme was unable to cleave Leu-p-nitroanilide and CBZ-L-phenylalanine. Digestion of endogenous proteins by CPR HG on time course study through SDS-PAGE shows no appreciable degradation within first 90 min. However, the disappearance of polypeptides of 96, 81, 66, 60, 58 and 21 k Da and appearance of new polypeptides of 73 and 59 k Da and intensification of 56 and 29 kDa bands were observed on SDS-PAGE with increasing digestion time (Fig 10). In vitro digestion of native horse gram seed proteins by CPRHG. 100 μg of digestion mixture was loaded on the each lane of the 8% SDS-PAGE gel. The protease activity was clearly inhibited at lower concentrations of Zn2+, Hg2+ and Cu2+ (0.5 mM). However, metal ions like Ni2+, Co2+and Pb2+ were shown an inhibition on above 1 mM. Mn2+ at higher concentrations (above 1 mM) stimulated the activity. Metal chelating agents such as 1, 10 phenanthroline and EDTA had no effect (Table 4 &5). The CPRHG activity was neither inhibited by aspartyl modifying reagent (pepstatin) nor by serine modifying reagents (DIPF, soybean trypsin inhibitor, eserine, PMSF and aprotinin). However, the activity was completely inhibited by sulfhydryl modifying reagents (pCMB and iodoacetamide). We also observed the complete inhibition by histidyl modifying reagent (DEPC). These results suggested that the CPRHG is a cysteine protease, with cysteine and histidine residues at the active site (Table 5). Addition of sulfhydryl reagents (cysteine, dithiothreitol, glutathione and β-ME) reverses the strong inhibition by pCMB (Table 6 &7). The polyclonal anti-CPRHG could recognize 81, 41, 30 and 27 k Da polypeptides from crude extract of germinating cotyledons. Presence of HMW 81 k Da protein in the first 2 days of germination and disappeared by day 3. The 41 k Da polypeptide was noticed in the extracts from days 0-3. The intensity of 30 k Da endoprotease (CPR HG) in the cotyledons of germinating seeds increased up to day 2 and declined later. Similar profile was also noticed for 27 k Da polypeptides (Fig 3). These results revealed that the enzyme CPRHG synthesized as zymogen (preproenzyme with 81 K Da) and processed to a 40 K Da proenzyme and then to the 30 K Da active enzyme which is further degraded to a 27 K Da product. Maximum endoprotease activity was observed in day 2 cotyledons of horse gram seeds during 4 day germination period and also shown pH optima in acidic region suggesting that the enzyme is located in the vacuoles [3, 7, 10, 17, 18]. The role(s) of specific proteases in seed protein degradation is unclearly understood, indeed, the overall role has been focus for direct investigation. We made an attempt to purify the endoprotease (CPRHG) from the cotyledons of horse gram and studied its properties and physiological role in the degradation of storage proteins. The purification procedure yielded an essentially homogeneous preparation with an over all recovery of 4.59% and 118 fold purification. The final recovery of CPRHG (4.59%) was similar to that of other plant cysteine proteases i.e., vicilin peptidohydrolase (8.0%) from mung bean seedlings  and GA3- induced protease (3.38%) from barley aleurone layers , 15% acidic protease from germinating winged bean  and 12% from Indian beans . The specific activity of the purified aspartic protease was 0.64 U/mg with a recovery of 20% and existed as a single form from Ficus racemosa . CPRHG appeared to be monomeric protein with molecular weight of 30 k Da (Fig 2) similar to other cysteine proteases isolated from germinating Vicia sativa , soyabean , barley  and wheat . However, the molecular weights of cysteine proteases isolated from Vigna mungo seeds varied between 20-30 k Da  and in barley 30- 37 k Da [25, 26]. Purified CPRHG was found to contain two isoforms with iso-electric points, pI 5.85 and 6.1 (Fig 4) as that of aleurain, isolated from aleurone cells, with two isoforms of pI values 6.0 and 6.1 and purified thiol protease from barley also had multiple forms including EP-A and EP-B . CPRHG exhibits acidic pH optima by showing higher activity at 5.5. Discrepancy in pH optima was noticed for various protein substrates used in the assay, since a given substrate will have numerous ionizable groups with similar pKa values. The pH optimum obtained with a protein substrate reflects more about the pH - mediated susceptibility of the substrate to proteolysis than about the influence of pH on the protease as a catalyst. A similar susceptibility to pH had been described for endopeptidase from Phaseolous vulgaris , barley  and wheat . Since the purified CPRHG was found to be stable in mildly acidic pH range 5.0 - 6.0, the enzyme may be localized in vivo in protein bodies like in other legume seeds [6, 7, 10–13, 29]. 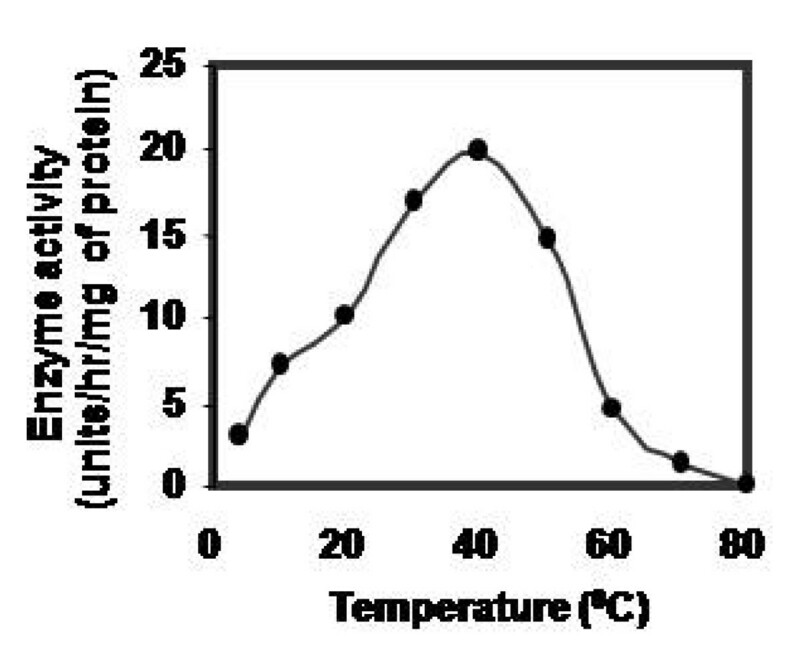 The enzyme (CPRHG) exhibited surprisingly high temperature optima at 40°C and the catalytic reaction was linear with time for at least 4 hr at this temperature, which reflects resistance to autolysis and the results were correlated to the proteases of lentil seeds  and barley [20, 22]. CPRHG showed a high degree of specificity towards the natural substrates i.e., seed proteins from horse gram seeds and had completely an endoproteolytic activity, which suggested an important role in the mobilization of seed proteins during germination. In vitro digestion of seed proteins by purified CPRHG led to the gradual disappearance of high molecular weight polypeptides. An aspartic endoprotease from wheat also exhibited the similar endoproteolytic activity with no exopeptidase activity . Studies with Phaseolous vulgaris , Phaseolus mungo , mung bean , Glycine max [13, 34], wheat  and winged bean  also indicated the role of cysteine endoprotease in the mobilization of stored proteins. We have employed various inhibitors specific to each class of proteinases (metallo-, asp-, serine and cys-) in order to investigate the amino acid residue(s) contributing to the active site of the enzyme. Inhibition of the enzyme activity by heavy metal ions and inhibitors, sulfhydryl blocking reagents, and the reactivation of pCMB - treated enzyme by the addition of sulfhydryl reagents clearly established the thiol nature of the enzyme. However, the partial inhibition by other sulfhydryl blocking reagents suggests the involvement of other residue(s) also in enzyme activity. The strong inhibition of CPRHG by DEPC suggested the involvement of histidine at the active site along with cysteine as proposed for papain . However, thiol proteases purified from winged bean  and Phaseolous vulgaris  did not belong to the papain family. Generally all thiol proteases have three conserved pairs of cysteine residues in their mature domain. However CPRHG contained only one pair of cysteine residues (Table 2). This data suggested that CPRHG showed homology to other proteases, such as EP-C1 of Phaseolous vulgaris  and EP-A of barley . Temporal changes in the levels of CPRHG in the cotyledons of germinating horse gram seeds were observed by immunoblotting. In addition to 30 k Da protein (CPRHG), the other three polypeptides with 81, 41 and 27 k Da was also cross-reacted with the antiserum. These results are similar to the development of endoprotease activity in germinating horse gram seeds, where increased development from day 0 to day 2 and decreased further . Information obtained from NBRF protein sequence data bank and translated Gen Bank database indicated that several cysteine proteases are produced as zymogens . The polypeptide (CPRHG) with ≥ 30 k Da in the immunoblot appeared corresponding to the putative enzyme and the 81 and 41 k Da polypeptides to the corresponding prepro- and pro-enzymes. The 27 k Da polypeptide probably originated from the 30 k Da protease. The endoproteses in the seeds of Vigna mungo , castor beans  and barley [20, 40] were found to be synthesized as proenzymes and processed to the active forms during germination. The temporal variations in CPRHG activity, its acidic pH optimum and its ability to degrade native seed storage proteins preferentially fulfilled the criteria laid down for a protease to be involved in seed storage protein degradation during germination. It appears that the newly synthesized protease is inactive, and activation takes place during germination. The reported enzyme has broad substrate specificity and stability in pH, temperature, etc., therefore, this protease may turn out to be an efficient choice in pharmaceutical, medicinal, food, and biotechnology industry. Sephadex G-100, CM-Sephacel, LMW markers were procured from Pharmacia Fine Chemicals, Uppsala, Sweden and DEAE-cellulose, aprotinin, p-chloromercuribenzoate (PCMB), N-ethylmaleimide (NEM), phenylmethylsulfonylfluoride (PMSF), iodoacetamide, Soybean trypsin inhibitor, eserine, diisopropylflourophosphate (DIFP), bestatin and 1,10- phenanthroline, diethylpyrocarbonate (DEPC), CBZ-L-phenyl alanine and L-Leu-p-nitroanilide were purchased from Sigma Chemical company, USA. All other chemicals, unless otherwise specified, were of analytical grade and purchased from Specrochem (India) and Qualigens (India). Horse gram (Macrotyloma uniflorum (Lam.) Verdc.) seeds were procured from Agricultural Farm of Andhra Pradesh Agricultural University, Rekulakunta, Anantapur, Andhra Pradesh, India. Horse gram seeds were surface sterilized with 0.1% HgCl2 solution for 5 min, washed repeatedly with sterile water and soaked in 10 volumes of water for four hours. The imbibed seeds were set to germinate at room temperature (30 ± 2°C) at 12 h dark and 12 h light cycle for four days in sterile petri dishes lined with four layers of filter paper. Sterile conditions were maintained by including 20 ppm of streptomycin sulphate in the incubation medium (water). The cotyledons harvested for two days were used for the isolation of CPR HG. Cotyledons were ground thoroughly in a mortar adding four volumes of chilled 0.05 M Tris-HCl buffer, pH 7.2, containing 2 mM β-ME. The extract was filtered through four layers of cheesecloth and the filtrate was centrifuged at 10000 g for 15 min at 4°C. The supernatant was used for isolation of the enzyme. All separation procedures were carried out at 4°C, unless otherwise stated. The crude enzyme (endoproteinase) extract was prepared as described above from 100 g of cotyledons (day 2) was subjected to ammonium sulfate precipitation. The precipitate obtained between 30% - 60% ammonium sulfate saturation was collected and dissolved in minimal amount of extraction buffer and extensively dialyzed against 0.01 M Tris- HCl buffer, pH 7.2 containing 2 mM β-ME at 4°C (1:200 volume ratio with 2 h change upto 12 h). The dialysate was loaded on DEAE-cellulose column equilibrated with 0.01 M Tris- HCl buffer, pH 7.0 containing 2 mM β-ME. The bound proteins were eluted with a linear gradient of increasing ionic strength of potassium chloride (0.5 M) in equilibration buffer and 5 ml fractions were collected. The fractions (14-20) with higher enzymatic activity were pooled and brought to 60% saturation with pulverized ammonium sulfate at 4°C and centrifuged. The pellet was dissolved in minimal volume of 0.02 M sodium acetate buffer, pH 5.5 containing 2 mM β-ME and dialyzed against the same buffer at 4 °C for 12 hr. The dialysate was loaded on CM-Sephacel column equilibrated with 0.02 M sodium acetate buffer, pH 5.5 containing 2 mM β-ME. The unbound fractions were collected and concentrated by lyophilization and stored at -20°C. Criteria of purity at each stage was checked by 10% SDS-PAGE. Endoprotease (EP-HG) activity was measured by using chromogenic substrate, azocasein, following the method described by Sarath et al  with slight modifications. 0.25 ml of 1% azocasein (prepared in 0.02 M sodium acetate buffer, pH 5.5 containing 2 mM β-ME) was mixed with 0.15 ml of enzyme extract or 150 μg of purified enzyme (1 mg/ml) and incubated at 40°C for 1 hr. The reaction was arrested by adding 1.2 ml of 10% TCA and mixed thoroughly. The contents were allowed to stand for 15 min and centrifuged for 5 min at 3000 rpm. 1.2 ml of the supernatant was transferred to a tube containing 1.4 ml of 1 M NaOH, mixed and the absorbance was read at 440 nm against the reagent blank. 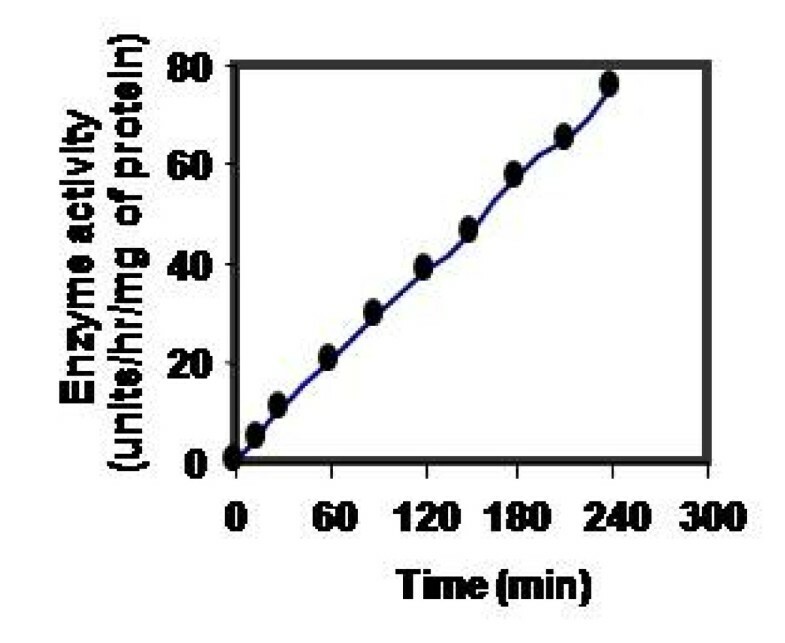 One unit of protease activity was defined as the amount of the enzyme required to produce an absorbance change of 1.0 in 1 cm cuvette under the conditions of the assay. The protein was hydrolyzed with 6N HCl for 24 h at 110°C in an evacuated sealed tube. The hydrolysate was filtered through Whatman No.1 filter paper and the filtrate was evaporated to dryness in a flash evaporator and the amino acid composition was analyzed on model 119 CL Beckman amino acid analyzer. Cysteine residues were measured by performic acid method . IEF and 2D electrophoresis of purified enzyme was carried out according to the method of O' Farrel . The molecular weight of the purified protease was determined by Sephadex G-100 gel filtration (2.4 × 132 cm column, flow rate 2 ml/min) and also through SDS-PAGE . The effect of pH on enzyme activity was determined by carrying experiment at different pH using sodium acetate buffer (pH 3.5 - 5.5), sodium phosphate buffer (pH 5.6- 7.0) and Tris-HCl buffer (pH 7.2 - 9.2). The enzyme activity was assayed as described. The effect of temperature on the enzyme activity was also determined at different temperatures ranging from 10-80°C for 1 hr in 0.02 M sodium acetate buffer pH 5.5, containing 2 mM β-ME using the same assay as described. The storage stability of the of the purified enzyme (CPRHG) was investigated by storing the enzyme at different temperatures, -10°C, 4°C and 30°C and its stability for a week was tested by withdrawing an aliquots of the enzyme at different intervals of time and was assayed for the enzyme activity. The purified CPRHG and azocasein were taken as described earlier and incubated at 40°C for 4 hr. Aliquots were withdrawn from incubation mixture at different intervals of time from 0 - 4 hrs and the azo compound liberated was measured as described. Polyclonal antibodies against the CPRHG were raised in rabbits by injecting 100 μg of the purified protein. Antibodies were used for immunoinhibition, immunodiffusion and immunoblot to check their specificity (44). Extracts of the cotyledons from germinating seeds harvested at daily intervals for 4 days were subjected to SDS-PAGE and the proteins were transferred on to a nitrocellulose paper. The proteins on nitrocellulose paper were treated with primary antibody (anti-CPRHG) and successively with secondary antibody (Ig-alkaline phosphotase). The bands were visualized by using NBT and BCIP in Tris HCl buffer, pH 9.0, containing 10 mM MgCl2 and 100 mM NaCl . 150 μg of CPRHG in 0.02 M sodium acetate buffer pH 5.5 was preincubated with 10 μl of different metal ions, selected inhibitors and sulfhydryl reagents at varied concentrations for 1 hr at room temperature and the assay was initiated by the addition of azocasein and the activity assayed as described. pCMB (10 mM) treated protease was reincubated prior to the assay with sulfhydryl reagent (5 mM and 10 mM) for 1 hr at room temperature and the activity was assayed as described. The proteolytic activity was compared with the control experiment containing all the components except the SH-reagent. The relative digestibility of endogenous and exogenous proteins by the purified CPRHG was measured by incubating 1 ml of 1% protein (dry seed protein, BSA, casein, hemoglobin, gelatin) prepared in an appropriate buffer mixed with 0.15 ml of the purified CPRHG (1 mg/ml) and incubated at 40°C for 1 hr and the amino acids released were estimated by ninhydrin method . Presence of exopeptidase activity was checked by using L-Leu-p-nitroanilide and CBZ-L-phenylalanine as described by Chrispeels and Boulter  and Sarath et al. , respectively. Suitable volumes of dry seed protein extract (1%) and CPRHG (1 mg/ml) were incubated as described, at various intervals aliquots were withdrawn from the digestion mixture, mixed with 2× sample buffer, boiled for 3 min and subjected to SDS-PAGE. RJ is thankful to the University Grants Commission, New Delhi for financial support. RJ designed and carried out the entire study of purification and characterization. VRK helped in drafting the manuscript. KSR helped in designing the experiments. PRR conceived of the study and participated in its design and coordination and helped to draft the manuscript. All authors read and approved the final manuscript.